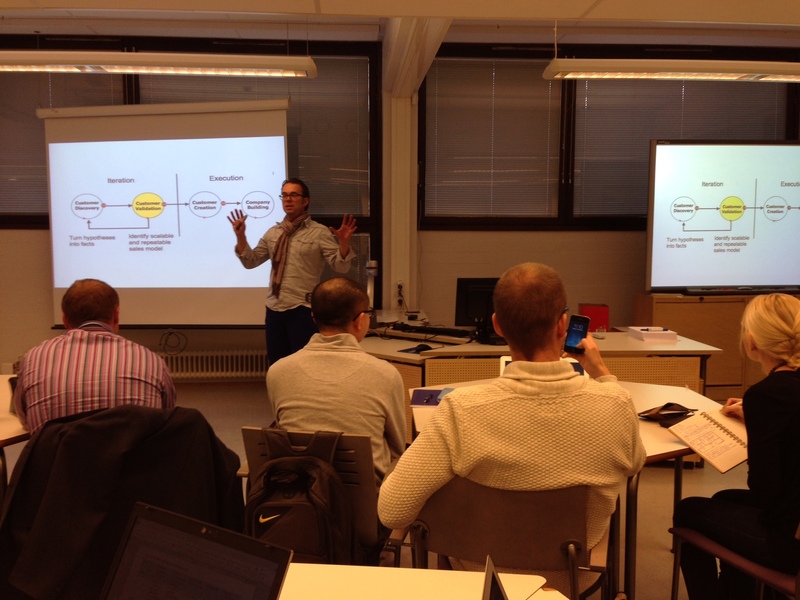 On 10 November 2013, Ola Sundell, CEO of Hub Helsinki, talked at Laurea University of Applied Sciences about one of the hottest topics of service design today: the concept of lean thinking. The basic idea of lean thinking is to produce maximum value to the customer with minimum waste. Ola gave us some guidelines on how to build up a start-up company by using this new approach. In lean innovation the key to success is to find the right markets with the help of customers. The best way to enter the market is to start working with innovators and early adapters. Instead of expensive marketing campaigns, you can validate your ideas by using innovators and early adapters as a runway to the market. Ola Sundell even advised us to forget the open innovation paradigm where the keys to success are new ideas flowing in and out of the companies. Ideas are worth nothing if they aren’t selling. A lean launch is a new way to enter the markets. In contrast to the traditional waterfall model, where you have different development phases from concept, development and testing to launching, lean launch means that you enter the markets right away with your product idea, targeting the customer with a minimum viable product. Customer development methods – Learning is the core!